Downtown Sushi Party With Karaoke! It's been almost exactly five years since the unpleasantness, and, I have to say, that Silhouette Sushi is now truly back, and in a good way. More laid back than Kenichi or Uchi, Silhouette has good sushi, a convenient Congress Avenue location (718 N. Congress Ave), and even the occasional DJ. 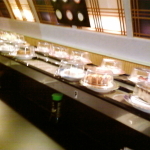 Read more about Downtown Sushi Party With Karaoke! Read more about Buffets And Boats Are Back!